Tropico 5, the latest installment of the Tropico franchise, has come out showing why it’s one of the leaders in the genre. It is crazy top think that Tropico, first debuted 13 years ago. Where has the time gone? The fifth installment has updated many parts of the game, but some are saying, not for the better in some areas. Which, is easy to see because Tropico 4 was on many peoples favourite games list, and still is. Lets see what has changed and what is still the classic Tropico gameplay. The most notable addition to the game is the new era system. You start at the Colonial age, and through objectives in the game, you transition you way into modern times. You fight through wars and major events to get to modern day. Each era has a different look and feel to it to make the era differences more noticable and along with the era’s, the technology you can research is also limited by what era you are in (starting to sound like Civ5). The game has definitely played out the whole Colonial age and I welcome this change, even if the game is morphing into other games like it. You get your world to produce and populate, finding people homes and jobs, and get them into a routine. The people all have individual “feelings” in which they live by. Some love you, some hate you. Try to make them happy as possible (a la SimCity). You constantly try to keep your political progress in an upwards direction, but in all types of politics, it’s never always uphill. You can decide what type of country you want to run. Socialism, dictatorship, or simply free. You will always have people who oppose you, but it is up to you to decide on how you want to deal with them. 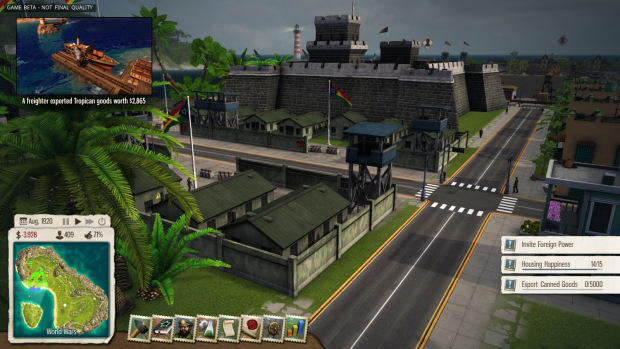 Along with the new era system the political part of the game is what makes Tropico 5, the new future of the series. There is a problem though with the system in which you are given information. It seems, unless you know exactly where to look, you will not easily find what you are looking for until you stumble upon it. I personally (since I never played Tropico 3 or 4) had a hard time finding everything. Took me a good 15 – 20 mins trying to learn where everything was. And that feels like eternity for an experienced gamer. Luckily there are tutorials for nubs like me. The tutorials do a good job of telling you whats new and what the main objectives are, but fails to fully explain where everything is. Really the best way I have found to learn a game, is to either get in there a play around until you miss up and start over, or watch someone play it first on sites like youtube. I prefer the play it myself way. I hate screwing up, but it is the best way to learn. The biggest downfall so far to this game is the character customization. Many people have said this is a step back in the wrong direction for the series. They have limited how you can change your character and it seems like everyone in the family is the same. Tropico 5 also has co-operative and competitive multiplayer. You can have up to 4 players that can build their own cities and any map. You can choose to share resources or declare war on each other. With the resources, in both single and multiplayer, you can use trade routes to both import and export, but be sure to make them secure with your fleets. The storyline is pretty much the same as it always has been. You are the Presidente, and you need to rule and expand your rule. You create a lineage of family members that all have unique traits. They will go about the town and do their own thing and make you money. The campaign mode has a little storyline to it but it’s more just a sequence of events than an actual story line. There really isn’t much more to go into about this as it’s not a linear style game. The graphics in Tropico 5 have been upgraded, and boy do they look pretty. Shadows are well done, textures flow nicely, and I didn’t find to many graphical glitches. The detail of every little citizen is amazing. You can sit there and watch them go about their daily routines, that is, if you don’t care about what your rule is doing and most likely falling into oblivion. The menus are easy to read, though like I said earlier, can be hard to find what you are looking for. The game boasts that there are over 100 buildings in each era to build which is a pretty decent number. Tropico 5 is a definite upgrade to the series. Apart from the lack of family customization and the hard to get information, the game is a definite buy. A $39.99USD pricetag in this genre is a steal of a deal. This game takes the best of other games in the genre, and puts them all into one. If this is where Tropico ends their franchise, it will not go out on a sour note, but lets hope not because they have awesome trailers like this.